PALMDALE – The Palmdale Sheriff’s station graduated its third “Teen CERT” class in a ceremony Tuesday night held in the Palmdale School District’s boardroom. The Community Emergency Response Team (CERT) program teaches citizens how to prepare and take care of themselves, their family and neighbors in the event of a disaster or emergency. 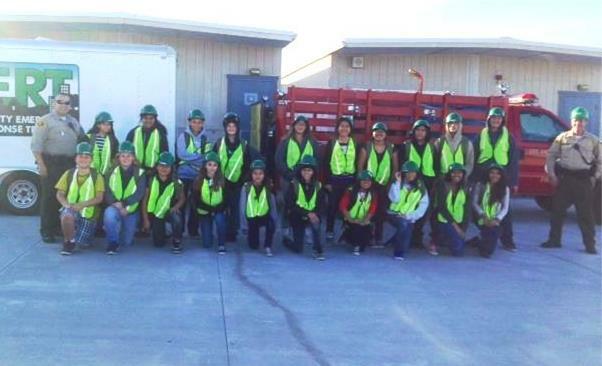 The Palmdale Sheriff’s station partnered with the Los Angeles County Fire Department, the Palmdale School District and members of the local area CERT group to present the teen CERT course. 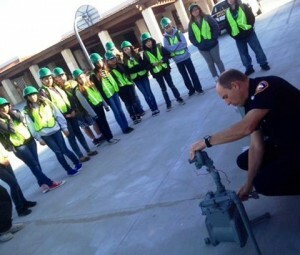 Classes were held as part of an after school program at Cactus Middle School in Palmdale. More than 100 middle schoolers initially signed up for the program, which was held over a five week period. Deputy Dale Lovvik facilitated the course and was aided by the following Antelope Valley CERT volunteers: Pat Rossall, Julie Ferbee, Michelle and Steve Webb, Marla Stark, Reserve Deputy Bobby Foster and Fire Captain Scott Polgar. Each applicant was required to submit an essay and complete an interview process along with their parents in order to enter the class. Twenty-three lucky students were selected and attended the two hour classes, which were held twice a week. Deputy Lovvik created a study guide for the students, which highlighted important facts and concepts from each chapter of the Federal Emergency Management Agency (FEMA) CERT manual. Although the study guide is not a substitute for the FEMA manual, it included full color pictures and renderings that helped to make the material more exciting to younger learners. Past graduates assisted Deputy Lovvik and school faculty members with fire and earthquake drills; and the students become advocates of the CERT program to their peers, families, friends and neighbors. Preparing for a disaster is a community effort, advised the Palmdale Sheriff’s station. For more information on how you can be prepared, visit www.AntelopeValleyCERT.com, www.Palmdale.LASD.org; www.LACounty.gov; or .